One word to sum up SU’s 72-49 win over Northeastern tonight? Boring. But that’s exactly how the Orange wanted it to go. Frankly, that’s how it was supposed to go. Unlike Cornell, Northeastern out of the CAA conference, an objectively much better team than the Big Red, never threatened Syracuse in the second half. Perhaps the most impressive part about the game was SU’s balance. Contrary to last year, where the Orange relied heavily on Frank Howard and Tyus Battle, SU didn’t really need either veteran guard Tuesday night. Battle finished with two points, the lowest point total since a February meeting with Louisville in his freshman year and Howard again struggled personally with two points as well. Pretty amazing the Orange could dominate a game start to finish with just four points combined from those guys. The senior point guard is clearly still not himself on offense. However, he is playing under control, minimizing the turnovers (two tonight) and more importantly the Orange are now 4-0 since the senior floor general has returned from injury. After what we saw at MSG, it was easy to assume no Frank wasn’t the only problem. It may not be as simple as getting him back. But the numbers sure do make it seem that way. Syracuse without Frank Howard this year. Syracuse with Frank Howard this year. Regardless, this is a different team. Luckily for SU, the committee will take into account the fact that Howard wasn’t on the floor for that pathetic display in the garden. In fact, the more they play like they did Tuesday night, the more those games will have an asterisk on their resume. Oshae Brissett feasted on the smaller Huskies all night long. He finished with 21 points and 14 rebounds, good for yet another double double. Safe to say Brissett, like the rest of the team, doesn’t look anything like he did at MSG. He was a man amongst boys all night and it somehow felt like he didn’t even really have his jumper. Perhaps the best part of the night for Syracuse fans was seeing Buddy knock down some shots. The prodigal son had a career-high 11 points and went 4-10 from the floor. He wasn’t completely relying on the three like in games passed and just looked way more confident out there. More like his preseason self. It might be Northeastern in the dome. But let’s not forget the Huskies beat Alabama earlier this year at a neutral site. 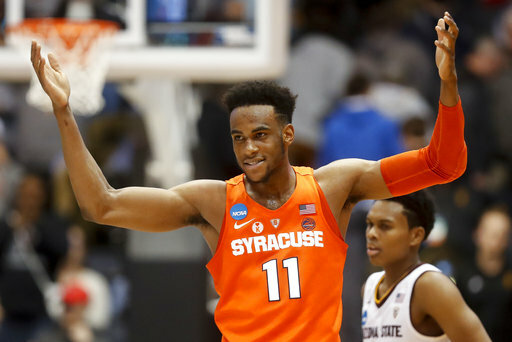 They are a potential tournament team if things click and regardless of the opponent, it was pretty clear Syracuse played perhaps its most complete game of the season start to finish Tuesday night. Next up Georgetown on Saturday. Buddy wants you to know its still a rivalry.